Tasteful Vineyard Home nestled among vineyards above winery with incredible views. Very Private. Perfect for honeymoons! Sleeps 4. INTRODUCING THE LAUJOR VINEYARD LOFT! No need to keep looking for that ideal place to impress your 'Significant Other' or to find that perfect balance of privacy, comfort and spectacular views. This BRAND NEW loft is located on the Laujor Estate Vineyards, surrounded by 360 degree views! Laujor Estate is located in the heart of the highly-acclaimed Red Hills AVA-Grape Growing Region. The LAUJOR VINEYARD LOFT is perfect for your Wedding Night, Anniversary, Birthday or Honeymoon! Ideal for a Relaxing Get-Away and Romantic Wine Country Retreat! This is the perfect gift for your favorite Wine-Lover! Gift Certificates are available! Walk down a flight of stairs to the Laujor Estates Tasting Room and be spoiled by Owner-Winemaker, Cheryl or Sweet Caroline. Then, after a glass or two or award-winning wines, crawl back up the stairs for a nap! You'll never forget your dinner and bottle of Laujor Estate wine on your private balcony, suspended over some of Mother Nature's finest work! 'Lucido's Luciously Lavish Laujor Loft' is tastefully designed and furnished with your comfort and viewing pleasure in mind! Of course, this deluxe loft has a fully-equipped kitchen, washer and dryer, large flat-screen TV, air conditioning and wifi internet. The owners have not scrimped on space in the bedroom or bathroom or large kitchen and dining area. Even 'non-cooks' will want to stay in for dinner when they see the one-of-a-kind views from the deck or dining table. It will be obvious that owners Cheryl and Dave Lucido have spared no expense when considering your needs and comforts...from the design of the loft down to the plush linens and towels. The LAUJOR VINEYARD LOFT is close to many local favoites, boating, fishing, kyacking, hiking, biking, golfing...or just staying in and enjoying the views and wines! 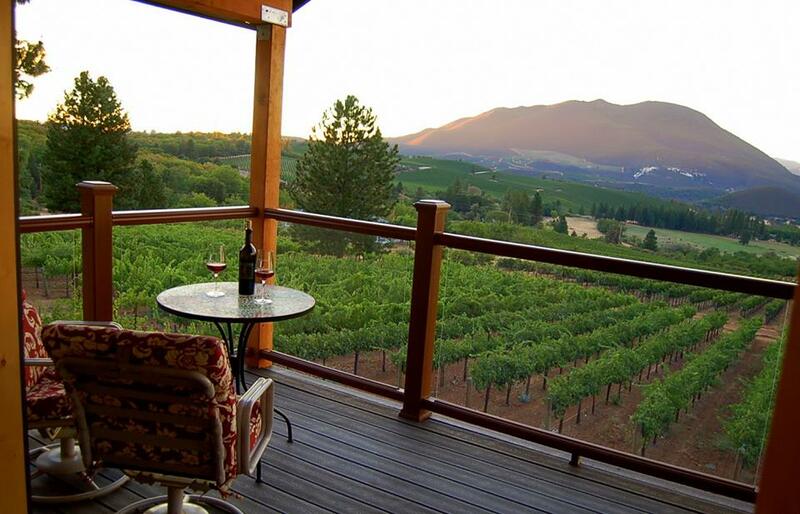 The Laujor Vineyard Loft is a Smoke-Free property...so don't even think about it! Inquire about Children and Pets. All Credit Cards accepted via PayPal. The LauJor Vineyard Loft is located about 45 minutes north of Calistoga / Napa Valley and about 2 hours from Sacramento and San Francisco Bay Area. Close to Lakeport, Kelseyville, Clearlake, Harbin Hot Springs, Mount Konocti. An awesome base for day-trips to Napa, Sonoma, Marin, SF, Mendocino, etc. Enjoy wine tasting without the attitude! Enjoy Lake County.